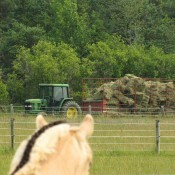 Nothing says summer like 700 bales of sweet-smelling first-cut hay neatly stacked in the barn! 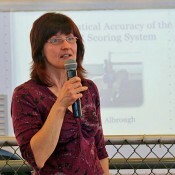 Lori was at the Norwegian Fjord Horse Registry’s Annual Meeting held in Norco, CA from February 13-16, 2015 to present a talk “Mathematical Accuracy of the NFHR Scoring System”. Happy news from Australia! 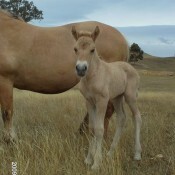 Welcome to Mogly’s first offspring in Australia, born on January 12. Knight’s Hill Kristoff is a lovely colt out of the mare Yrsa. In these pictures he is about 12 hours old. Falke wins National Champion Mare of Belgium! Exciting news! 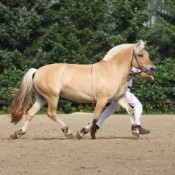 Last week our stallion Mogly’s daughter Falke became the National Champion Mare of Belgium. Woo Hoo! I must say, we are really lucky to live in this area where we can take advantage of so many opportunities to train, learn, and improve! I just came back from riding in a Biomechanics clinic this past Thursday, April 3rd, with Russell Guire of Centaur Biomechanics. It was held at Whitaker Stables near Orangeville, Ontario. At an age when a lot of people are contemplating slowing down and retirement, Alice MacGillivray made the decision to make her back-burnered life-long dream of horse ownership a reality. A thoughtful planner, Alice did copious research as well as following the pull of her heart in deciding to make her first horse a Fjord. 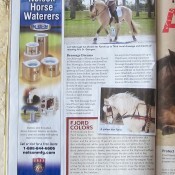 We were pleased when Alice made the decision to purchase the lovely Fjord mare Bocina from us in the fall of 2010. 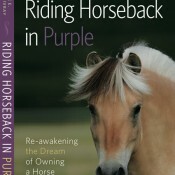 And yes that is Bocina on the cover of Alice’s new book, just recently published! The March 2014 issue of Horse Illustrated is out, and you can “Meet the Norwegian Fjord” in Samantha Johnson’s article “The FJORD Factor”. Yours truly is one of several Fjord experts interviewed, and our stallion Mogly and I are pictured training in Wellington Florida. 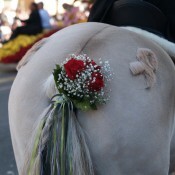 Bluebird Lane extends a hearty congratulations for a job well done to the team that represented our Norwegian Fjord Horse Registry in the 2014 Rose Parade in Pasadena, CA! On January 1, in front of over eight hundred thousand spectators and broadcast nationally, this group of Fjord owners made us proud by presenting 13 beautifully turned-out Fjord horses, exhibiting the unique traits of our wonderful breed and their Norwegian heritage.